The sweat is running down my face, my arms are burning and the rain is soaking me through. Simon is up front on our tandem bike changing up through the gears and calling “go” at the start of another push during today’s interval session. We’re training for my first sports challenge since becoming paralysed. It was only 16 weeks ago that I landed in Denver Colorado. Large snowflakes settled on me as I rolled out of the taxi and made my way into the University of Colorado’s Health and Wellness Centre. Joe Verrengia from Arrow Electronics, the guy who has funded this entire project as part of their sponsorship of CBS TV’s ‘Courage In Sport’ documentary, had dropped over from their head office in the city. We rolled past the indoor track, weights machines and free weights. I could hear the thump, thump, thump of people pounding out miles on the treadmills and the familiar whoosh of people taking stroke after stroke on the rowing machines. However, the hand bike was my target. 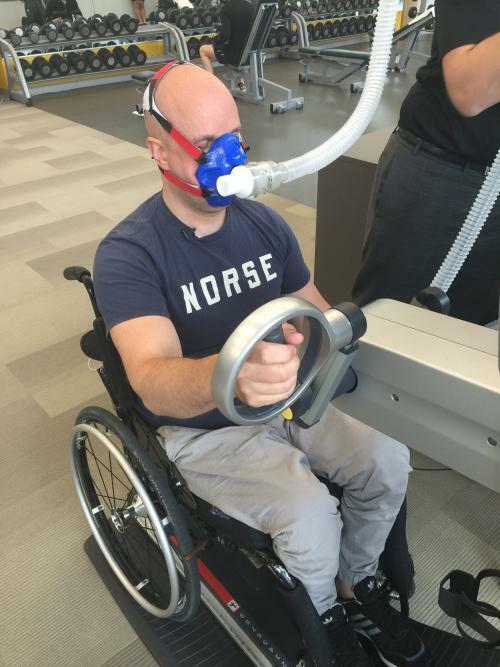 I had to perform an incremental VO2 Max test, the same kind of test I did when I used to row and the same test that I did in preparation for the South Pole Race. The difference was that in the past I tended to perform these tests after months of training. This time I was going to test without any training sessions under my belt; into the unknown with a CBS TV crew filming it all. Shanon Squires from the Human Performance Lab was beside the hand bike getting a mask set up to analyse my oxygen and carbon dioxide levels and arranging a series of tiny needles to take blood from my ear at intervals throughout the test. But in the midst of the negative voices I could hear my old rowing coach Tim Levy’s advice about how to approach the first test of the season. “Just get a score on the board”. His point was simply to lay down a marker – once you have a score recorded you can’t hide from it. You either train well or don’t train well. You either improve on that score, or you don’t. The test is just the evidence of what you do in training. And so I got a score on the board. Pitiful at best but a score nonetheless. And, that test was used to set all of my heart rate training zones for the initial phase of training – (much lower than I would have expected based on past experience before paralysis). Things are surely different now I am paralysed. And this new body I am testing is also evolving and changing since I‘ve been walking in my robotic legs, electrically stimulating my spinal cord and getting my heart rate up to steady running levels. Yet this level of training is simply not enough for where I want my fitness to be. And, the test score was simply evidence of the training that I had been doing in the previous few weeks and months – clearly not enough. But over the last 16 weeks I’ve improved. Since that first test in Denver I have completed nearly 150 training sessions, lost 4 kgs in bodyweight and done two more VO2 Max tests. Each time the score on the board has got better. Now I have 4 weeks to go until the Giant’s Causeway Coast Sportive. By the time I sit on the start line on my custom built tandem bike I will have 20 weeks of training completed, 180 training sessions and hopefully a big group of friends all in our matching Team Unbreakable jerseys. 1. Be part of our crusade to find and connect people to fast track a cure for paralysis. 5. Get a copy of the award-winning documentary ‘Unbreakable – The Mark Pollock Story’. Mark Handbike from Mark Pollock Trust on Vimeo.